Back in April 2007 when Christine Bakke and I launched the Beyond Ex-Gay website, we knew it was only the first of what we hoped would be several organic steps we envisioned to help support fellow ex-gay survivors. Our goal has been to help survivors connect with each other both on-line and in person. I remember how thrilling it was at the Ex-Gay Survivor Conference in Irvine when I saw people in person for the first time, some after years of connecting on-line through blogs and social networking sites. We had developed deep and meaningful connections through our often vulnerable sharing with each other on-line and were able to jump right into even deeper connections. Christine and I have always planned on creating a social networking site just for ex-gay survivors. We didn’t want to rush though and get ahead of ourselves. This is a volunteer effort, and we don’t like to do something that is not thoughtfully considered. We have spent the past two years consulting with other people who have run social networking sites to find out the difficulties that arose with moderation and in creating community. We looked at various technologies, some well outside of our price range. We finally settled on Ning.com, which offers flexibility and options for customizing pages, engaging in discussion and creating groups. For now we want to focus primarily on people who have had ex-gay experiences. These are not just people who attended ex-gay programs, but also those who tried on their own to change or suppress their orientation or gender differences. Some of these ex-gay survivors may also have been leaders of ex-gay programs at one time. We have also met transgender individuals who as part of their own life experience have spent time in ex-gay treatment. So much gender policing happens in ex-gay programs. Although we have come to a place of understanding that change was not possible or necessary for us, we also recognize that the treatments and theories that once influenced our lives and view of the ourselves and the world have often caused harm. 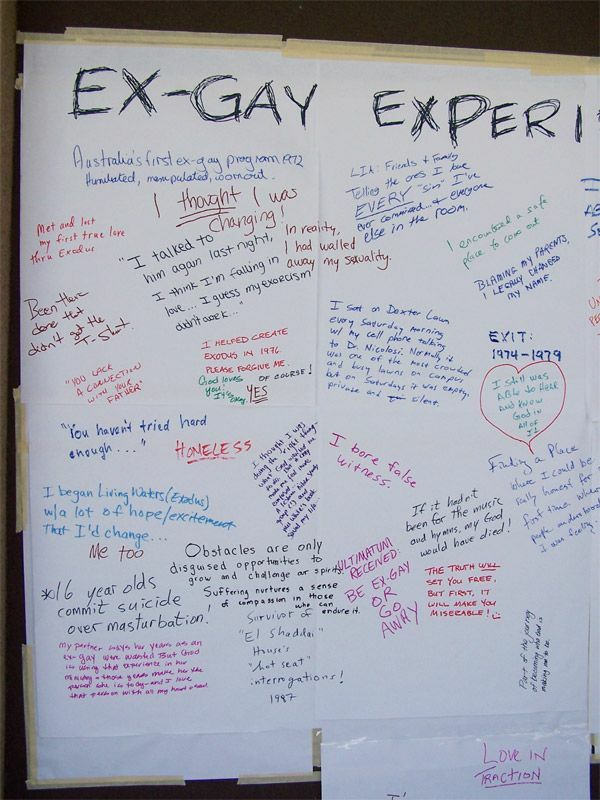 Over at the bXg site I list the various types of harm that several ex-gay survivors say they encountered as a result of trying to straighten themselves out. Christine and I have met many straight and LGBT allies who have never had ex-gay experiences themselves yet have been effective in activism, supportive to survivors and present during our gatherings. For now we want to limit the Beyond Ex-Gay Community social networking site just for survivors and not for allies. Some allies struggle to understand how some of us say we experienced both good and bad during our ex-gay experiences. They don’t always understand the complexity of our experiences, and in their passion for justice or for showing empathy sometime express anger and judgment that does not always help in our own process of trying to understand exactly what happened in our lives and how to respond to it. Below I have posted the basics from the new Beyond Ex-Gay Community site. It will operate as an invitation only site for now. If you are an ex-gay survivor and want to know more about the community site, Send me an email requesting an invite. Also include a brief overview of your own ex-gay experiences. WHO: This site is for people who at one time attempted to suppress or change their sexual orientation or gender differences either on their own or with the assistance of others. We have since determined that for us change was not possible nor is it necessary. We understand that by pursuing such a change, we may have encountered more harm than good. We now choose to move beyond our ex-gay experiences and affirm ourselves as lesbian, gay, bisexual and transgender individuals. WHAT: This site gives ex-gay survivors an opportunity to connect with fellow survivors to discuss our ex-gay experiences (what we did, why we did it, the harm as well as the good that may have come of it) as well as the issues surrounding recovery from ex-gay experiences. 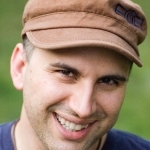 This site is a SAFE SPACE for ex-gay survivors and not a forum for anyone but ex-gay survivors. Harassment, preaching, shaming, etc will not be tolerated. Honest sharing, thoughtful exchanges, funny stories, helpful suggestions are all very welcome. We also recognize that many of us come from religious backgrounds, some quite abusive. We seek to maintain a site that it is a safe space for religous/spiritual and non-religious/spiritual people. We endeavor to respect each individual’s personal journey and not impose our own on another. This site is not to take the place of therapy or professional treatment. If you feel uncomfortable or not ready to connect with others about your ex-gay experiences, or feel you have already done this and need to move on, than this site is not for you at this time. WHY: We have discovered that many people who have not had ex-gay experiences do not understand the complexity of such experiences. We share many similar stories and many differences. We struggle with the fact that we may have encountered loving kind people and positive experiences along with the trauma we endured. Through connecting with other survivors, many of us have found clarity and insights. We have found mutual support and friendship. I’m glad you’re doing this. It seems like having that online community will help a lot of people. What you’ve done already has been very helpful in peoples’ lives. Much respect to you and Christine for continuing to work on this project, and for opening up much-needed lines of communication. Yikes! I wish I could edit my previous post – looks like I said that the dissertation was about pedophiles at a specific school, not that the guy who did the degree/dissertation went to a good school. Thanks for the explanation about allies. I wish you and Christine all the best with the invitation only strand to your Beyond Ex-Gay ministry. And I pray that it will be a useful and encouraging support for the people who use it.